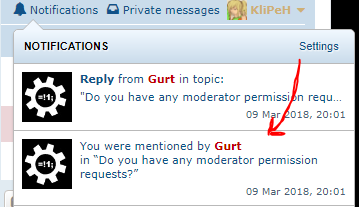 A mention is a call-out of sorts that allows you to ping forum members without having to quote them and without them needing to post in a thread on their own in order to receive a notification. Mentions can be used for many reasons, whether it's to poke fun at other members, to ask for their input on a certain subject, or to give them credit for work they did. All that's required of you to do is to type an 'at' symbol (@) into the textbox, write the first few letters of the user's nickname and then choose it from the list in the drop-down window. Now instead of simply writing "KliPeH", a mention of me would look like this: "@KliPeH". Important Note #1: In order for a mention to properly notify a user, it needs to be in the original version of the post. Posting a reply and then adding the mention as an edit will not make the post notify the person you just added. Have you heard the new SFD soundtrack? It was made by @Splinter. I hear the final version will contain many more custom-made tracks but I've yet to hear any. How's that coming along, by the way? @TheOriginalCj and I are looking to play SFD with other people on the weekends but nobody's joining our server. More info down below. The solution @Gurt offered hasn't worked for me and I have been unable to play the game ever since I created the thread. P.S. Huge thanks to @JakSparro98 who helped me figure out how to fix script XYZ. There's still some tinkering to do with the system, such as checking whether we can make color tags overwrite the default red color of the mention or whether we can make it automatically link users' profiles upon mentioning them, but seeing as this extension doesn't have any control panel settings it's not likely we'll progress much in that regard. This is the extension we're using. If you have any experience with it, any ideas on how to use it better or suggestions about upgrading it please let us know! Re: User @mentions are now a thing!